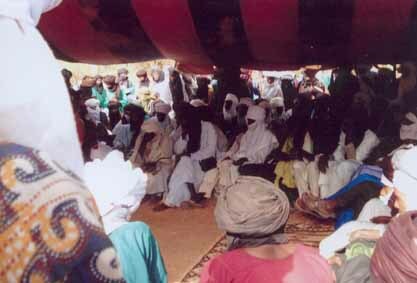 Niger's Pastoralists' Social Forum is organized by the pastoralists' collectif Djingo. Representatives of all the member associations gather there annually to think about their social, political, economical and cultural situation; to contribute to the prevention of religious extremism and violent intercommunal conflicts in the northern region of Niger through information, education, communication and the reinforcement of non-violent mechanisms to prevent and settle conflicts; and to contribute to the information, education, and sensibilisation of youth on the risks inherent in clandestine migration and indoctrination. The general assembly is organized in a different semi-sedentary site each year. In this way each group can show how they have organized themselves, the progress they have made and the existing needs. This year's edition will be held in the semi-sedentary site of Foudouk Natou in the rural community of Ingall (more information below). To finance this forum, Djingo counts on visitors' contributions. All member organizations taking part in the forum pay a 50.000 CFA registration fee. Travel agencies visiting the forum pay a 150.000 F CFA registration fee. The contribution for individual travellers will be 20.000 CFA, about € 30 or $ 36. Foudouk Natou is a young village, founded in 2001 by a young generation of Wodaabe pastoralists of the Bingawa clan to keep their people in one 'zone d'attache'. It's situated 57 km east of Ingall, more precisely 7 km east of the intersection of the RN25 Tahoua-Agadez. It borders on Agareygarey in the nord, Guirmagale in the south, Injagaran in the west and Marendade in the east. It has 2,639 Wodaabe and Touareg inhabitants devided over 377 households. Foudouk Natou is a registered village with at its head village chief Nassamou Malam, who has the complete trust of the people and his hierarchically superiors. Apart from the existing infrastructure (school, medical centre, cooperative shop, cereal bank and lifestock food bank) the place is traditionally constructed in straw. 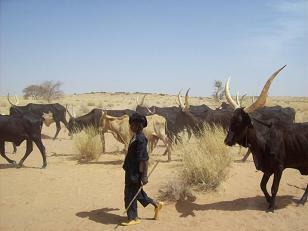 Cattle breeding is still the main occupation of Foudouk's inhabitants. They breed cows, goats, sheep, camels and donkeys. Milk and cheese are mostly consumed, only part of it is sold. The animals' health is generally good. Only jackals are a curse, attacking sheep and goats in this area. Environmentally, the site is a place where runoff water streams, whose centrifugal forces prevent good infiltration, meet and cross: hence the abundant growth of trees, bushes and all kinds of wild herbs. There is little wild life because of the presence of pastoralists. Jackals, rabbits, deer and small birds live here. As for the handicrafts, the different handworkers in the village are women weaving mats and wind shields and doing embroidering, and men who work with leather. These products are generally sold in the village itself and on the markets of Ingall, Agadez and Niamey. There is little local commerce. Still there are the cooperative shop and the cereal bank to meet the villagers' needs. The villagers's are in good health as Foudouk Natou has its own medical centre, so the sick can be treated without the need to travel far. Foudouk Natou has a primary school with a school canteen constructed in 2003 by the local development bank. It was enlarged with two dormitories, thanks to the relation of the village chief with an American donor. The school now has six classes, three teachers and two cooks, who are payed a monthly salary of 80,000 CFA by the pupils' parents. There are 114 pupils in the school, 58 girls and 56 boys. Foudouk Natou has a 55 m deep concrete well and a 48 m deep traditional well. They provide the population with enough water. Still, the village would like to get a small drinking water supply line.